I took about 59846656KBs of random lossless PNG/lossy JPG files and compressed. 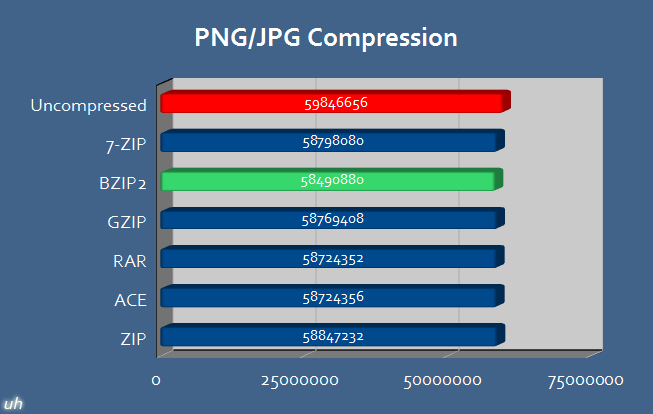 They best compressed as a BZIP2 file and shrank to 58490880KBs at 2.2654165% compression. That's because BZIP2 does the best compressing for types of files that are already under some form of compression. 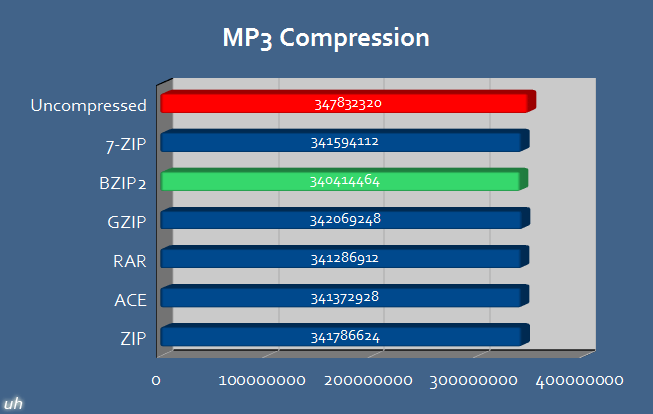 347832320KBs of MP3 files best compressed as a BZIP2 file and shrank to 340414464KBs at 2.13259538% compression. MP3s are not very compressable since they are already compressed. 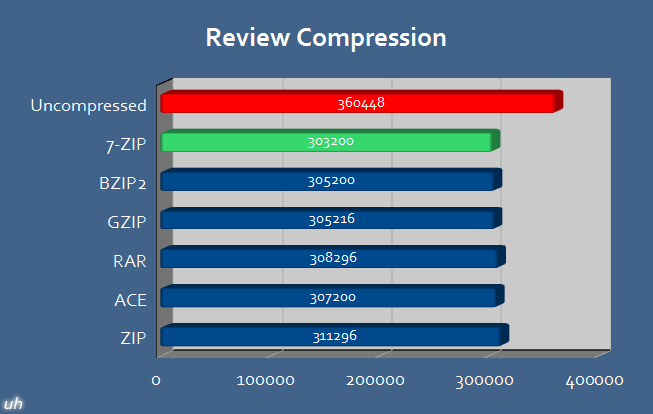 I think that's the trend for BZIP2; working best on already compressed files or hard to compress files. Well, the compressing of a Unique Hardware review of 360448KBs was best done as a 7-ZIP file. to shrink to a size of 303200KBs at 15.8825% compression. A review is mostly text and a few pictures. So this would be the type of file most people compress; text and pictures. When I compressed all of Unique Hardware (except the forums), the 91975680KBs shrink to a size of 83480576KBs at 9.2362503% compression. This is similar to the review compression test except much more files and most of them being pictures. Well, from these sets of tests, it's safe to say that 7-ZIP is the best compression. I don't really care for the time it takes to compress files, since saving time on the server end, saves time on the download end. 7-ZIP can also compress as BZIP2 files, so when you have things that are very hard to compress you can choose BZIP2.